The holiday season can mean a host of different things: decorating, celebrating, lights, spending time with family, helping seasonal businesses ramp up, and getting ready for the new year. For Stratus.hr employees, it also means selecting a charitable organization to be the recipient of employee and client donations. Stratus.hr’s Sub-4-Santa committee is an employee-driven group that selects the charity, announces the program to employees, and coordinates employee and client donations. In years past, the group has worked directly with individual families, local schools, and Kids Eat, an organization that fills weekend backpacks with food for school kids who may not have food otherwise. 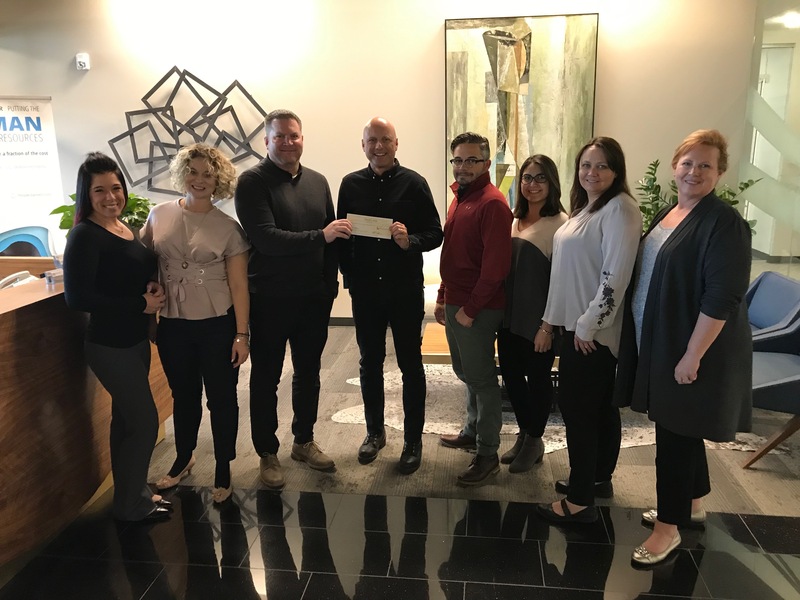 In mid-November this year, Stratus.hr presented NAMI with a check for $1,800, representing contributions from employees, clients, and client employees who want to improve life for people with mental illness. “We can’t give as much as big corporations, so we involve our clients. This collective effort allows these non-profit groups to extend their reach a little further and make a much bigger impact than we can on our own,” said Farnsworth. Focus on charities with missions similar to your company’s. Forbes magazine indicates this is step #1 in selecting a charitable organization for your team, and Farnsworth agrees that it builds more excitement for employees, too. Empower employees to make the final decision. As a business owner, you may have a charity you already work with closely — and that’s fine. But allowing employees to select the company’s charity ensures engagement will be high. Ensure you’re not accidentally forcing donations. Giving should be voluntary, which is why it’s advisable to keep competition out of the donation process. For example, rewarding the team that donates the most money can put unnecessary and unwanted pressure on employees who may be cash-strapped or have a different charity that they’d prefer to give to. One exception: canned food drives, which can get a big boost when a little competition is added. Look for opportunities to make the charitable connection personal. This includes opportunities to help the charity onsite or even to learn from the charity. If, for example, your charity is a homeless shelter or a food bank, inquire about donating time. Take every opportunity to learn. Learning from the charity can make the impact even greater. After their charity selection this year, NAMI taught Stratus.hr employees a suicide prevention class. Information learned will be invaluable for the company’s HR consultants, who work directly with employers and employees and need to be prepared with resources and information. Employees from Stratus.hr present Robert Wesemann, Executive Director of NAMI Utah, with a check representing donations from employees and clients. Can I give my employee a gift card without being taxed? Do you need to offer benefits to get a candidate to take the job? Are breakroom snacks meeting your employees’ hierarchy of needs? With an MBA and an HR background, Sher helps with all sorts of marketing odds and ends such as articles, newsletters, emails, blogs, website content, ads, and more. When not juggling her four young children, Sher enjoys volleyball, basketball, racquetball, or anything else with "ball" at the end.